All of my cat rescue stories are, not surprisingly, centered around the cat. This one, however, is more about the cat owner, or, more precisely, the cat caretaker. Dottie has been taking care of Tuxie since he came to her as a feral kitten five years ago at her home in Petal, Mississippi. Tuxie, as you will correctly guess, is a black and white, tuxedo cat, and in spite of Dottie's best efforts, she could never quite get Tuxie to overcome his feral nature enough to trust her fully. Tuxie would show up on the front porch everyday and jump up on the small table there for his feedings. There they would hold their unique conversation and Tuxie would eat the food that Dottie provided. Tuxie made a home for himself under the back porch and considered that and the rest of Dottie's yard his own personal territory. Tuxie usually stayed just out of reach, but over the years occasionally allowed Dottie to touch him and even pick him up a couple of times. He did not like being picked up, but he tolerated it since it lasted for only a few seconds. But Dottie is the only one who could get away with that. In spite of the limits that Tuxie placed on their closeness, Dottie was very fond of him and always cared for him while hoping that he would gradually, over a long period of time, learn to trust her and relax with her. Two days before Christmas, Tuxie did not show up for his feeding on the porch. Dottie was concerned, but not alarmed. After all, Tuxie is his own boss and cats will be cats. She looked for him and checked under the back porch, but she did not see him. The next day, still no Tuxie. 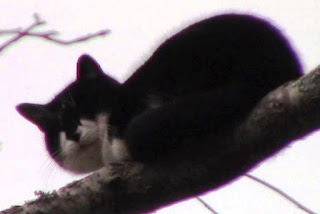 On Christmas day, some friends came over and noticed a cat up high in a tree on Dottie's property line. When they told Dottie about it, she looked and was surprised to see it was Tuxie. Dottie does not know if Tuxie had been in the tree the past two days or not, but he was certainly there now. Dottie tried to coax Tuxie down, but all her relentless attempts were futile. She called the fire department, tree service companies and everyone else she could think of, but no one could help her. As each day passed with Tuxie still in the tree, Dottie was losing hope and getting more desperate. The thought of his suffering up there for so long without any food or water was so troubling to her, that she even considered asking her husband to just shoot Tuxie just to end his suffering. Dottie had already recently suffered the death of an infant grandchild and the death of her dog. She did not want to experience the loss of her Tuxie on top of all that. 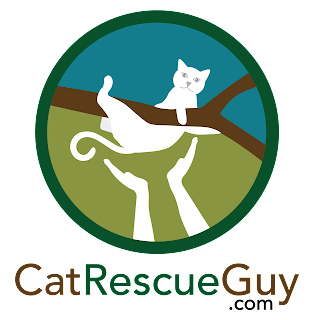 After the seventh night in the tree, Dottie finally found out about Bob Reese, the one and only cat rescuer in the whole state of Mississippi. She called Bob who, as it turned out, was visiting relatives in Alabama at that moment. He was planning to return to his home in Starkville the next day, but it would be a very long drive for him to go there and then down south to Petal. Bob and I are very good friends, and we share cat rescue stories with each other. He knew I might be interested in helping out with this case, so he called me. It would be much easier for me to handle this case than Bob, so I readily agreed to do it. The drive there would take me almost three hours, so I planned to leave early the next morning so that I could rescue Tuxie before the rain which was expected to arrive at mid-day. Hopefully, I would be able to rescue Tuxie on this last day of the year, Tuxie's eighth day in the tree, and put an end to the suffering which both he and Dottie were enduring. I arrived shortly after daybreak that morning, and, fortunately, the rain was holding off long enough that I should have time to rescue Tuxie. I quickly spotted Tuxie about 30 feet high in one of the trees growing along the property line. Like most feral cats stuck in a tree, he was silent. I met Dottie, and she told me all about Tuxie. I explained to her that feral cats are highly likely to either climb higher or jump from the tree when I attempt their rescue. Knowing that Tuxie was likely to climb higher, I wanted to set my rope up as high as possible. I spotted a branch at 50 feet and aimed my big sling shot there to launch a weighted bag connected to a long string. I planned to place the string over the branch and then use it to pull up my rope. This whole process often scares cats, both feral and tame, and I warned Dottie that it might cause Tuxie to climb higher or jump. Sure enough, Tuxie climbed up another 10 feet while I tried to get the string in position. When my string became stuck and I tried to pull it loose, it released suddenly and came completely out of the tree. I would have to shoot it into the tree again. When I shot the weighted bag and string into the tree the second time, Tuxie again was frightened into action. This time, however, instead of climbing higher, he started going down. He jumped to the next lower branch at times and climbed backward down the trunk at other times. He settled on one branch about 20 feet high. While he pondered what to do, I continued to work on getting the weighted bag to move where I wanted it to go, and I was having difficulty getting it to go around a branch that was in my way. While I was focused on that, I noticed in the corner of my eye the blur of Tuxie falling to the ground. I looked just in time to see him hit the ground with a heavy thud and immediately run to the back of the house. Since I was not looking at him at the time, I do not know if he intentionally jumped or accidentally fell. He appeared to be fine, but I still wanted Dottie to verify that after he emerged. The sooner I left the area, the sooner he would emerge, so I packed up and got ready to leave. Dottie was extremely relieved to have him down and very grateful to me for coming to help. She gave me a few warm hugs and wanted to offer something to me to express her gratitude. People often don't understand that I don't need or want money or gifts in exchange for my help. It is those feelings of relief, joy and gratitude that I see on their face that are my greatest reward. That's what I look for, and that is what keeps me going. Of course, knowing that the cat's suffering is over also has something to do with it. But Dottie's face and hugs showed her gratitude fully and beautifully to me, and because of that, I didn't find the three hour drive home long at all. In fact, it seemed pretty short. So Happy New Year, Dottie. May the loss and stress of 2016 be replaced with relief and peace in 2017. And may Tuxie not get stuck in a tree.